“I COME no more to make you laugh,” warned the opening line of “Henry VIII”, William Shakespeare’s last play. It was a solemn and underwhelming end to his career—so much so that many fans and critics found “The Tempest” a more fitting final bow, with Prospero’s abjuring of his magic a metaphor for the bard’s farewell to the stage. But it was “Henry VIII” that marked the end of an era, and the end of the Globe as it was known. The theatre went down in flames after an errant cannonball set fire to some scenery. “All Is True”, a new film, makes use of the original title of “Henry VIII” and begins in the immediate aftermath of the conflagration. A melancholy Shakespeare (Kenneth Branagh, who also directs) has quit London and returned to Stratford to his family. Judith (Kathryn Wilder), one of his daughters, is a shrew; the other, Susanna (Lydia Wilson), has married a Puritan bore. Anne Hathaway (Judi Dench) is cold and chides her husband for his prolonged absence; Shakespeare himself is still haunted by the death of his son, Hamnet, some 18 years earlier. Mr Branagh reveals a man who, though confident in his own talent, bitterly regrets the sacrifices it demanded. The film, for all its earnestness, suffers from the same problem that has plagued other depictions of the playwright: there is much mythology to strip away, yet few hard facts to work with. Though there is more information about the bard than similar figures of the period, the answers to pertinent questions—why did he marry so young, and to an older woman? What did he do in the years before he became a writer? Was he a Catholic? Atheist? Gay?—are elusive. Without important details, Shakespeare often remains an enigmatic genius, an icon, the “sweet Swan of Stratford”, which makes for an unsatisfying portrayal. Writers reimagining Shakespeare’s life have devised a number of strategies to make up for these lacunae. The first is to fill in the historical gaps (something the bard was adept at himself). There have been novels of his childhood, such as George Madden Martin’s “A Warwickshire Lad” (1916); of his apprenticeship, including Robert Payne’s “The Royal Players” (1956), and of his love life, the most successful of which is Anthony Burgess’s “Nothing Like The Sun” (1964). That novel presents Shakespeare as a bisexual enjoying a lasting affair with a prostitute, the “dark lady” of his sonnets; Burgess weaves suppositions into an intimately imagined story, making use of internal monologues and playful language. But these stories are often vessels for the authors’ own biographical theories, and can read like psychoanalysis or fan fiction. Shakespeare rarely emerges as a surprising and convincing character in his own right. Indeed many depictions, whether on the page or on screen, struggle to put convincing words in the mouth of a man renowned for writing excellent dialogue (“Anonymous”, Roland Emmerich’s execrable film, gets around this by suggesting that Shakespeare was a fraud and never wrote a line of the work attributed to him). This is perhaps why he is often written as a comic figure rather than a dramatic one. From “Horrible Histories” to “The LEGO Movie”, Shakespeare has popped up in incongruous situations, making clumsy remarks. Ben Elton—who wrote “All is True”—is also responsible for three seasons of “Upstart Crow”, a sitcom in which David Mitchell plays a much-put-upon Shakespeare whose moaning about public transport, among other things, allows for much anachronistic fun delivered in a jokingly cod Elizabethan English. Entertaining it may be, but it does not provide much measure of the man or his literary brilliance. Without a clear sense of the sources of his inspiration, writers have added their own. A recurring joke has involved ordinary people casually saying a sentence or phrase only for Shakespeare to jot it down and render it immortal. In George Bernard Shaw’s “The Dark Lady of the Sonnets” (1910) it is a beefeater standing guard at the palace who unwittingly furnishes the playwright with his most famous lines. In the British comedy “Time Flies” (1944), Evelyn Dall, a time-travelling music hall singer, provides him with the balcony scene for “Romeo and Juliet”. In “Shakespeare in Love” (1998), the bard picks up ideas when walking down the street. These allusions generate some knowing laughs that are soon forgotten, while suggesting that Shakespeare’s skill was less as a writer than as an attentive listener. 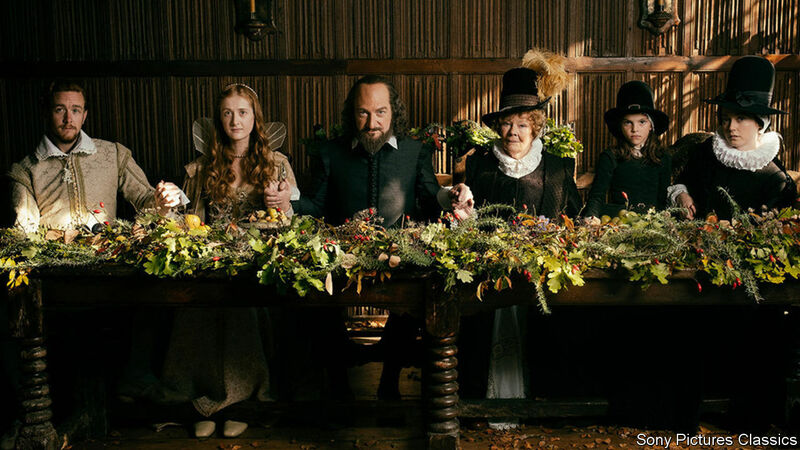 “All Is True” makes a serious attempt to consider Shakespeare as a husband and a father as well as a famous playwright, but is let down by its naff dialogue and melodramatic tone (he expires after a bout of loud coughing). That it disappoints shows how hard it is to reconcile Shakespeare’s vague and ordinary life with his extraordinary, well-known works, and why many writers and screenwriters have opted for either irreverent mockery or dewy-eyed bardolatry. The great dramatist’s story continues to elude dramatisation.